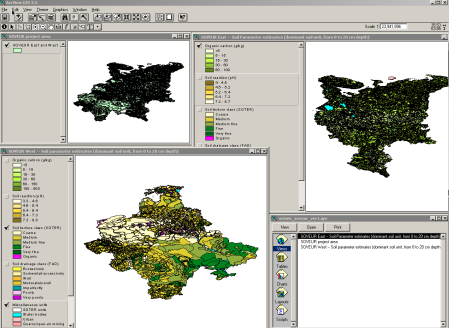 The Soil and Terrain Database (SOTER) was part of the Soil Degradation and Vulnerability Assessment for Central and Eastern Europe (SOVEUR project) and was implemented within the framework of the Food and Agriculture Organization (FAO) of the United Nations and the Netherlands Government Cooperative Programme. The project was technically coordinated by ISRIC - World Soil Information and assisted by the Land and Water Development Division (AGL) of FAO. The SOVEUR project has been carried out in close collaboration with specialists from soil survey institutes in Belarus, Bulgaria, Czech Republic, Estonia, Hungary, Latvia, Lithuania, Moldova, Poland, Romania, the Russian Federation, Slovak Republic and the Ukraine, who collated the various national soil data using uniform guidelines. 3) Batjes (ed), 2000. Soil Degradation and Vulnerability Assessment for Central and Eastern Europe - Preliminary Results of the SOVEUR Project. Report of concluding workshop (Busteni, 26-31 October 1999). Report 2000/04, ISRIC, Wageningen. b1fa4988-b511-48e3-9548-3c48f0a908fa Access to the portal Read here the full details and access to the data.